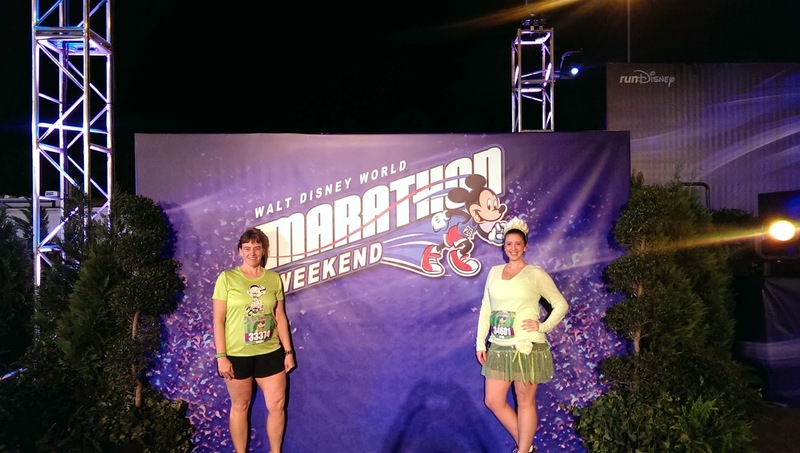 At 3 am last Thursday our alarms went off and we jumped out of bed, ready for Disney's Family Fun Run 5k! Well, it was more like a stumble, but we were awake! An hour later, we were out the door and on the bus to Epcot. 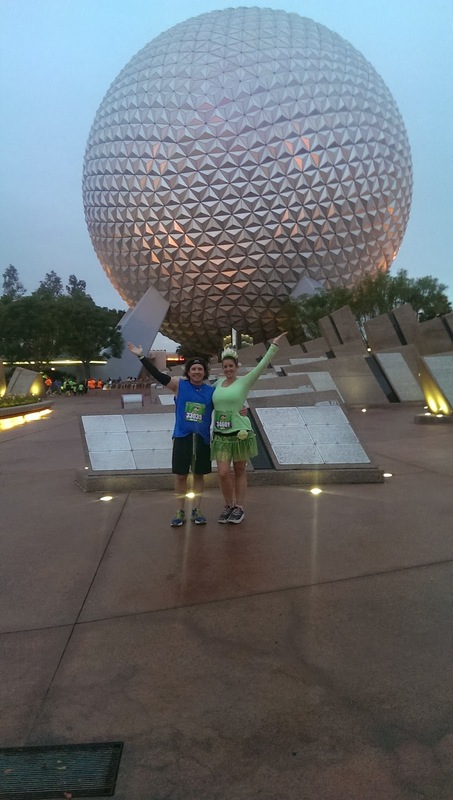 The 5k didn't start until 6:15 am but we got to Epcot around 4:30. This is normal for runDisney events- I call it the "hurry up and wait" method. They like to have you in your corral at least an hour before the race starts. I think they think it helps with organization of tens of thousands of people. Either way, we always like to be there early, especially to get photos with characters before the race. As we are getting off the bus and walking towards the runner area of the parking lot, someone getting off another bus yelled my name. It was Rhonda! Out of the 10,000+ people at this event, she had found me! Matthew, me, Rhonda, and her daughter Rabekah all exchanged hellos and hugs and then went to find some characters in the pre-race area. We walked toward the front where there are usually characters. There weren't any. We figured we were early. So we took some pictures against the backdrop of where they usually are and just chatted to pass the time. As we were chatting, Patrick (@whatthe5k) came up to the group and introduced himself. Yay for internet friends! As it got closer to 5:30, we finally gave up on the characters ever showing up and went over towards the corrals. 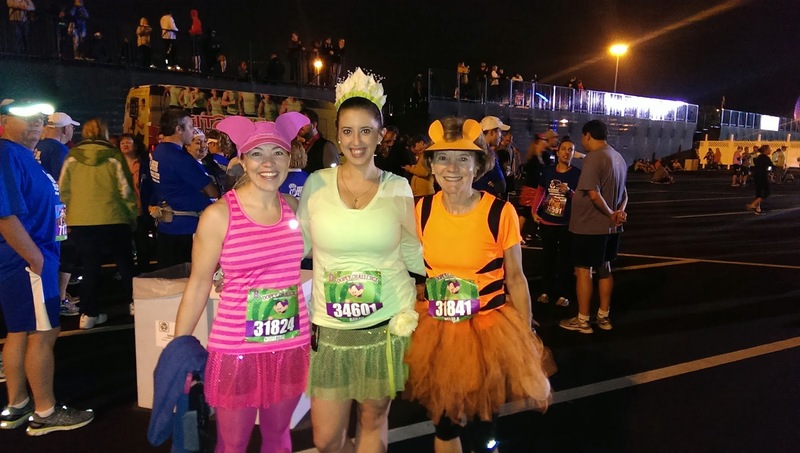 Walking past the port-o-potties, I heard someone call my name again- this time it was Christine and Pam from We Run Disney! Again, I don't know how we end up finding friends in crowds of thousands of people but I'm so glad we do. We were all able to catch up and talk Dopey strategy. We snapped a quick picture and then headed into our corrals. There were 5 corrals for this race, I was placed in "D" and Matthew in "B." Because we were running this one together, he stayed back with me in "D," the next to last corral. This was the first time I wasn't in "A" for a Disney 5k. They had us get into the corrals in one section of the parking lot and then would move each corral around in a jug handle (think left-hand turn in Jersey) pattern towards the start line. After the national anthem and the wheelchair start, corral "A" was off! By the time they got to our corral, the first finisher had crossed the line! We saw the confetti and heard the announcement before our start. About 20 minutes after the "A" corral we were finally starting! The first mile was around the parking lot in Epcot. Then we entered near Mexico in World Showcase. 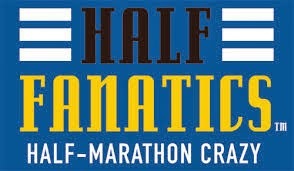 Our strategy for this race was to walk/run at a conservative pace, somewhere between 13-14 minute miles. That plan quickly went out the window. We were literally shoulder-to-shoulder with the other runners in our corral. It never thinned out. It was difficult to try and get any kind of rhythm that was more than a fast walk. There were a lot of walkers and small children in our corral. Neither of these things is a big deal, however, it did make the running path extremely congested with people walking in the middle of the road and children coming to a dead stop on the course. Once in World Showcase, we started to see some characters with some extremely long lines. Matthew and I quickly realized that there would be no way we'd be able to stay within the 16 minute/mile pace AND stop for pictures. For the first time in a Disney race, we didn't stop for any character pictures. It was disappointing. I think we were both very frustrated at how congested it was. While I believe in the corral placement system at runDisney, I think we were in a corral that was much slower than we actually were. We also weren't feeling great. The weather was muggy and humid- something we weren't used to running in. And there just seemed to be less Disney magic than usual. But, we had 3 more races to do! So we finished the 5k (a quick lap around World Showcase and a little jaunt through Innoventions) and headed back to the resort. Side note- there were characters at the END of the race this time, right where they usually were before the race. With CRAZY LONG lines. I find it frustrating that the characters would be at the end of the race- if you start in a later corral, there is no way you'd be able to get your picture without standing in line for 30+ minutes. 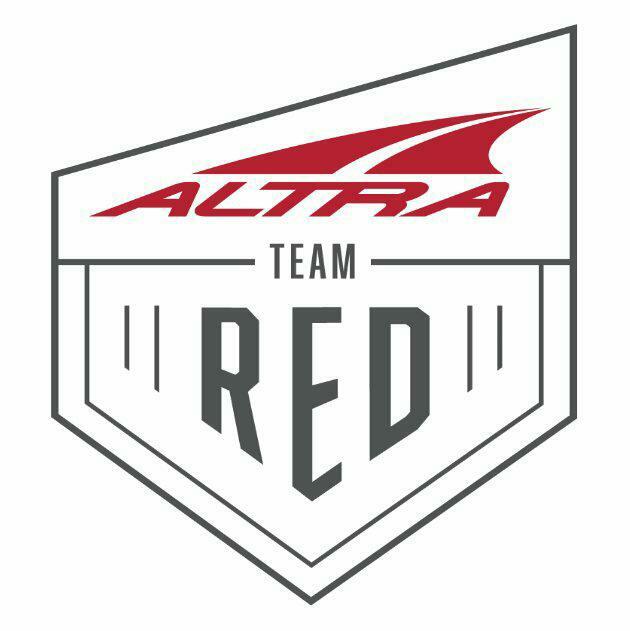 I wish they'd had them at the beginning of the race as they usually do. We HAD to stop for a quick picture with Spaceship Earth! Matthew loves this medal as Pluto is his favorite character. Once back to the resort, we got right on a bus to go back to the expo. 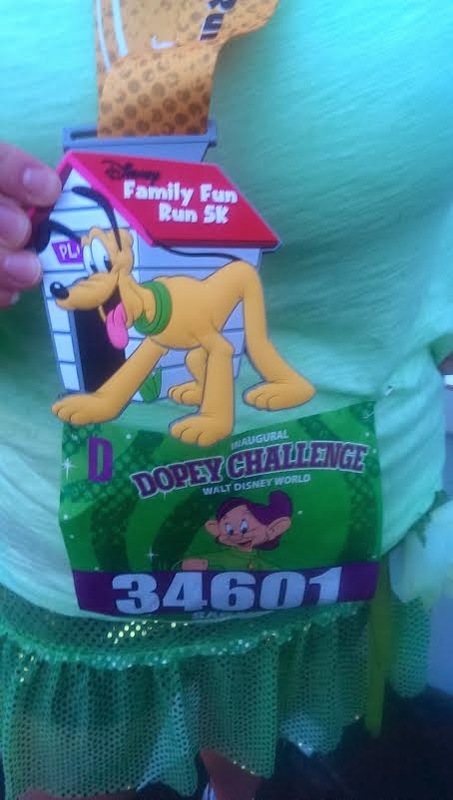 During the 5k, I convinced Matthew that he needed to at least TRY and get his Goofy shoes. So, back to Wide World of Sports we went! We arrived about 8:40am. The expo was scheduled to open at 9am. However, there were people already leaving with New Balance boxes in hand. We hoped there would still be some shoes left. We went straight to the line for the appointment times. After about a 20 minute wait, we filled out our information on an ipad and were promised a text with a time to come back to the booth. The New Balance reps told us we'd be waiting about 90 minutes until it was our turn. So, we went back to the expo booths, bought some cool stuff from One More Mile, chatted with Jeff Galloway again (!! ), and then finally were able to try on shoes when Matthew got a text from New Balance letting us know it was his turn. 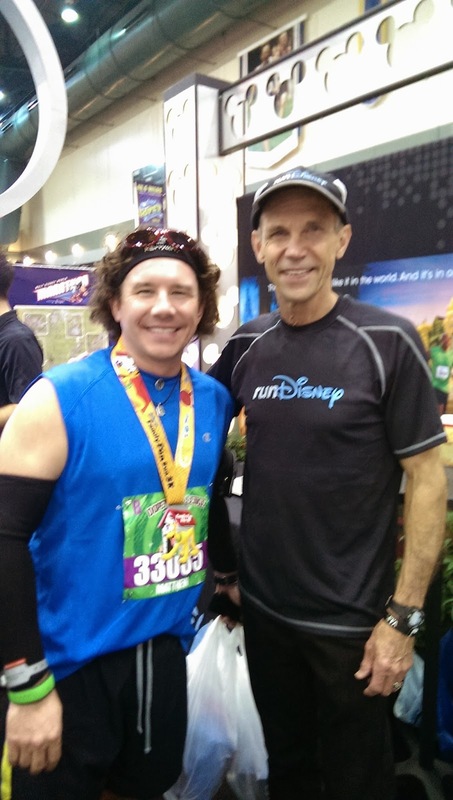 Chatting with THE runDisney guru himself! After we left the expo, went home and showered, we went right back out to Downtown Disney for a tweet-up hosted by some awesome people: Dani from Weight Off My Shoulders, Linzie from See Sharp Run and Katrina from Katrina Elle. 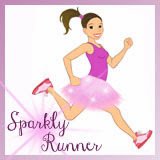 Not only did we make new friends, but we won some awesome give-aways including Sparkly Soul headbands, Energy Bits, and Honey Stinger gels. We also got to meet former Disney cast member Justin from Always Running Forward. We learned such cool Disney secrets from him! Then we checked out Disney Quest, had lunch at House of Blues, and then went back to the resort for another 6 pm bedtime. 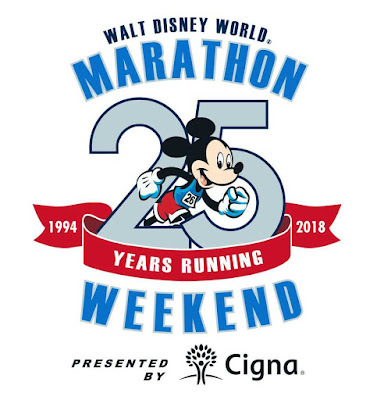 The Inaugural Walt Disney World 10k (and the new Minnie medal!) was waiting for us on Friday morning.